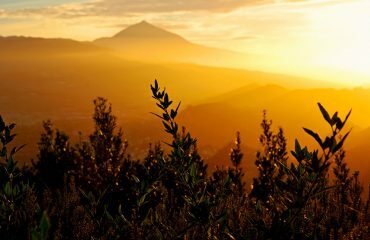 The highest peak in Spain, with 3,718 meters above sea level located in the Canary Islands, has been recognized worldwide for its spectacular skies and rich biodiversity. However, there are some peculiarities that have been unnoticed and that will surely surprise you as soon as you know them. 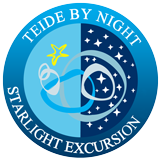 In Teide By Night we want to let you know some spectacular facts that will encourage you to discover more about the Teide and visit it. It is always a great place to return and lose yourself in its beauty. 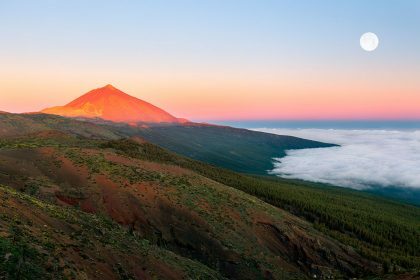 In our satellite, there is a mountain range with the name of “Montes Tenerife”, where there is, in turn, a mountain that wants to refer to the peak of Tenerife, that is, our Teide. This mountain has been called “Mons Pico”. Both formations are located in the Imbrium mare, since it was formerly thought to be a sea. 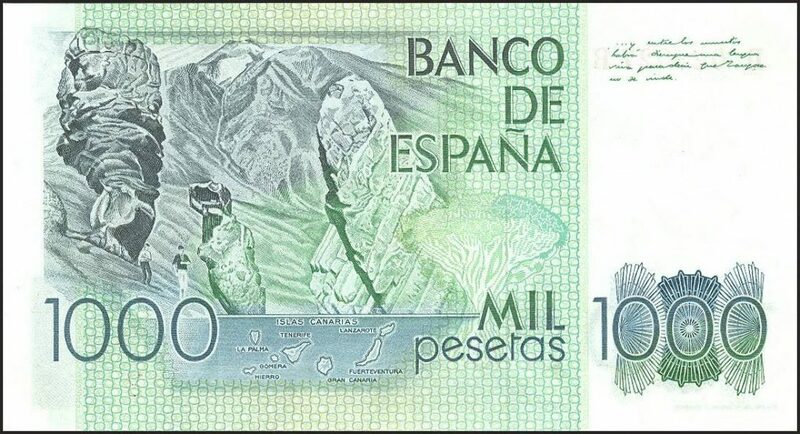 The bill of 1,000 pesetas in Spain, during the decade of the 80s, carried the Canary Islands in it. On the back. there was one of the most iconic images that have been taken from Teide, from the Roques of García in particular. If we compare the image of the bill with a photograph taken from the same perspective, we will know approximately from where the photograph was taken. In addition, on the obverse, it was the image of Benito Pérez Galdós, one of the most illustrious Canarian writers. Almost hidden and known only by very few people, it is the construction of a recovery center for people with respiratory problems. The work of this building was not completed but, in the last century, there were many visitors suffering from tuberculosis, bronchitis, pneumonia. etc. that came to the Canary Islands looking for milder climates. The patients built their own shelters, staying in the Teide National Park for long periods. Fortunately, the scientific advances helped patients to have other ways of recovery, so the construction of the center was paralyzed. To access this corner of the National Park, you can go through the path number 16, either from the cable car or from the National Parador, in this case, first through the path of the seven canyons. 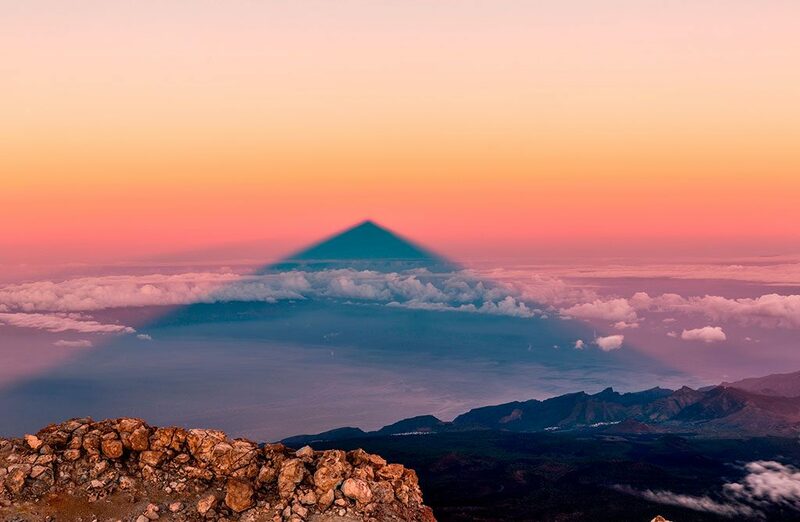 Although the Teide does not have a completely regular shape, its shadow’s projection represents a cone, given by the perspective created by the inclination of the Sun’s rays, which, being almost parallel to the Earth’s surface, lengthens and deforms the perspective. 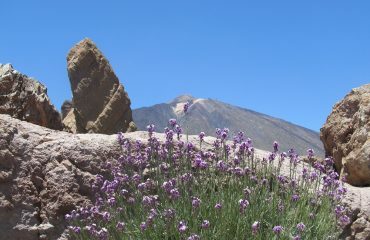 The Top of Guajara, 1,000 meters below the Teide, has been the scene of astronomical observation since the 20th century. The astronomer Charles Piazzi Smyth (1819-1900) went two months for doing studies in which he observed the Moon, the planets, even distinguished the rings of Saturn. It has also been a place to observe the trajectory of Halley’s comet. 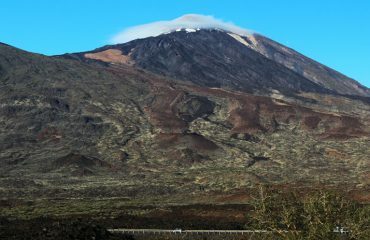 Since 1960, the Teide has been a special setting for filming in it. In 1966, the film One Million Years was filmed there, starring Raquel Welch. Recently other great productions have been shot like Ulysses against Hercules, Clash of the Titans, Fast & Furious 6 or Rambo V: Last Blood. There are many analogies between the conditions in the Teide and Mars. In fact, tests have been carried out on materials and research instruments that will be taken to Mars. In 2010, the Raman instrument was tested, as a part of the ESA-NASA Exomars 2016-2018 expedition. There have also been trial tests for the search for life on Mars and new robotic vehicles.